What to eat in Hat Yai? Not a foodie? Not travelling to Hat Yai Thailand? Well, you may skip this post! Its long and its all about food! If you still wish to read, well make sure you are not hungry ok? Travelling makes me hungry! Everytime right after I cross the Malaysian-Thailand border and arrive at Sadao, first thing Fried Chicken! This trip there was no fried chicken instead we went to a secluded place which serves authentic Thai Food Maimoke Restaurant รไม้โมก. Upon arriving at Maimoke Restaurant you will be greeted with lush greens and a man made pond, this is definitely a nice place for photos. The location of Maimoke Restaurant is strategic for a ‘Hello Thailand Meal’ or a ‘ Goodbye Thailand’ Meal because is located along the way. There is a common dining area or you can also choose to be seated in individual huts available. There is a huge selection of Thai Dishes here and the price is reasonable. I personally loved the Ha Mok Pla [ Thai Steamed Fish Cake or known to Malaysians as Otak Otak ] and the Deep Fried Fish! I’m on top of the world looking down on creation and the only explanation I can find… I wish I could tell you how much I love a great view from the top with great food and company! 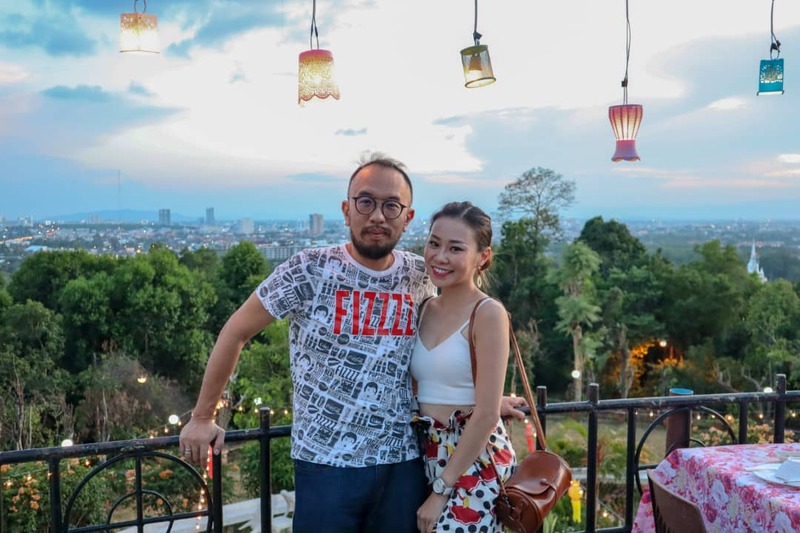 On my recent trip to Hatyai, Thailand we went for dinner at a restaurants that is on top of a mountain! If you already know where I am referring too than I am sure you have been there! This would have been my second time having dinner at Bon Khao Restaurant and I am still in awe. Bon Khao Restaurant offers a great view over Hat Yai and its mesmerizing. I totally love the colour of the skies whilst I was there, around 630pm local time. The Deep Fried Pork Knuckles here is the bomb! The pork Knuckles dipped in Sweet Chili sauce is just heavenly. I have had Pork Knuckles elsewhere in Hatyai, and personally non is comparable to this! Other dishes that I highly recommend would be the Green Curry Chicken and Pineapple Fried Rice [ had it last round, not this ] Be sure to Visit Bon Khao Restaurant if you have not, prices is slightly above average but it is worth the experience. I would suggest that you visit around 6pm so that you can catch both day & night view, and do not forget to bring a mosquito repellents as it is after all on top of a mountain. Ah yes, you should try travelling to the restaurant with a Tuk Tuk, it will be an experience, midway you might feel like the Tuk Tuk driver is bringing you to nowhere and start to be afraid, but fret not because he is bringing you to Bon Khao Restaurant. Dim Sum is a must not only in Hong Kong but in Thailand! One more place that I would surely return to is Cook Chai Dim Sum, I used to be a fan of Chok Dee but its always just too crowded with tourist and you need to get a number to be seated. Cook Chai Dim Sum is more popular with locals instead, and don’t get me wrong it's still crowded so be early. Their Fried Kuey Teow with Fish and Gravy is mind blowing, this is my first time trying this dish and I loved it! Never in mind mind would I have thought of Deep Frying the Kuey Teow. There is a wide selection of Dim Sum too and the Salted Egg Custard Bun is highly recommended , Bak Kut Teh is also available here at Cook Chai Dim Sum. Its funny how someone like me who doesn’t really eat any spicy food back home is actually eating a lot of spicy food in Hatyai, Thailand. No I am not complaining in fact I think I am really getting into this spiciness thingy! Lol, I even brought back Raw Ingredients so that I could whip up the same great ‘Gaeng Som’ I had at Hroy Restaurant หรอย . If you are flying into Hatyai, this is one restaurant that you should visit as its located near to the Hatyai Airport. The boss of the restaurant is Mr Hroy is is also the name of his restaurant. The restaurant isn’t anything fancy and has a small shop front selling local thai good where you can also find the Special ‘Gaeng Som’ Sauce which has won numerous awards. If you don’t know what ‘Gaeng Som’ is, well it is a hot and sour soup similar to Szechuan Hot and Sour Soup and there’s Seafood in it. Mr Roy was being very kind to demonstrate cooking his raved about ‘Gaeng Som’ and he made it look really simple with the ‘prepack sauce’ and the ‘Gaeng Som’ was ready in 15 mins top. The room was filled with the aroma of ‘Gaeng Som’ and as I couldn’t help but noticed that every occupied table in the restaurant had a bowl of ‘Gaeng Som’ on their table so I had to try it even tho I was warned that it was spicy! Indeed it was spicy but I had to take a second mouthful because it was soooo good! I think I had sausage lips after that, lol. If you find it a little to spicy do wash it down with a cold sea coconut dessert [ or bring your own milk..lol] So, if you visit don’t forget to buy a pack or two back and you can enjoy it in your own home! Check out this Video too!